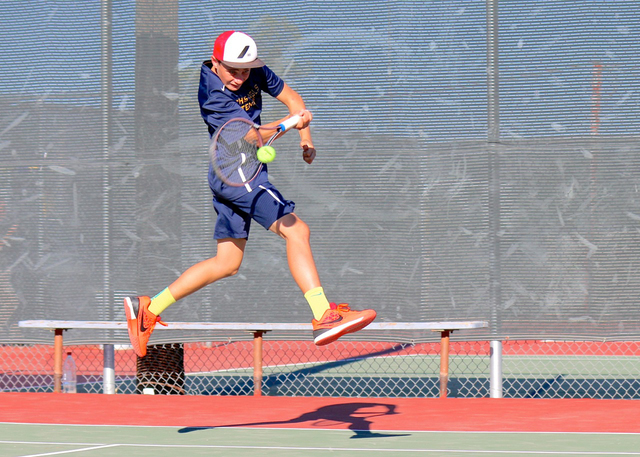 Boulder City High School’s boys and girls tennis teams head into the postseason with the Eagles finishing with a perfect 10-0 league slate, while the Lady Eagles finished with a 9-1 record. Laura Hubel/Boulder City Review Boulder City High School junior starter Garrett Leavitt, who plays doubles with Clayton Pendleton, is undefeated. Defeating Moapa Valley on Sept. 22 13-5 and Chaparral on Monday 17-1, the Eagles, top-seeded in the 3A Sunrise League, completed their first goal of a regular season sweep, with a postseason sweep on their minds. Behind a talented squad this season, the Eagles have a chance of making it out of regionals behind strong singles players junior Andre Pappas (10-0) and freshman Bretton Erlanger (9-1). Well-rounded all around, the doubles teams of juniors Garrett Leavitt and Clayton Pendleton (10-0), freshman Boen Huxford and Preston Jorgensen (9-1), and junior Tanner Montgomery and sophomore Karson Bailey (9-1) will be relied upon heavily to boost the Eagles’ chances of success. Freshman Ty Pendleton also could be called into action this postseason, serving as a third member of the Eagles’ undefeated doubles unit. Starting their postseason against Sunset fourth-seed Mojave at 3 p.m. today, the Eagles are confident about their chances of playoff success. The Lady Eagles also are postseason bound, acquiring the 3A Sunrise second seed after beating the Cowboys handily 16-2, despite losing their perfect on the road record, falling to the top-seeded Pirates 12-6. Happy about the progression of this year’s team, Dorne said she is proud of how far the Lady Eagles have come after dealing with the loss of two of their best players, Natalia and Harley Fullmer, who transferred out just days before the season started after participating in the team’s summer program. A large part of the Lady Eagles’ success falls on the progression of sophomore single player Natalie Bowman, who completed a 10-0 sweep this year for the girls, giving them a legitimate individual regionals title contender. Freshman Tegan Pappas also looks to have some individual success in singles competition after garnering nine wins during her first season with the program, along with the senior doubles duo of McKenna Frazier and Kyra Yamamoto, who accumulated nine wins as well. Looking to get off to a strong start in team regionals as well, the Lady Eagles will host Western at 3 p.m. Friday. ■ Today-Saturday, regionals, Darling Tennis Center in Las Vegas, TBA.